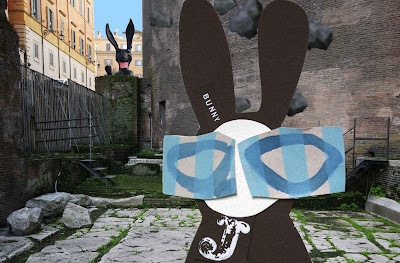 The Wabbit had hopped into a corner of the Pantheon just to see what was going on and after investigation had decided that that nothing much was happening. But as he turned to leave, his ears pricked to a crumbling sound and he jumped as small stones scattered on the ground around him. As he turned to look up he could hear the sinister cackle of a sinister rabbit peering over a wall. As larger rocks rained around him, the Wabbit took off with a turn of speed that would have surprised his friends and he loped around the circular building. He was too late. He could only catch sight of the pointed tail of a dark rabbit disappearing into a maze of small streets and he cursed several times under his breath. "That was close," thought the Wabbit as he hopped rapidly in the general direction of the Piazza Navona, But he could find nothing more dangerous than a smattering of tourists buying souvenirs and multi coloured balloons. "He had to go somewhere," thought the Wabbit and he stayed in the shadows and glanced back to the Pantheon. The light had begun to fade a little but he could just see the pointed ears and rancid teeth of an Agent of Rabit who had expertly regained his original position. The Agent waved but before the Wabbit could reach him, he somehow vanished, leaving only a cackling sound of derision. "He who laughs last, has the laughiest laugh, or something like that," muttered the Wabbit and he took a small piece of Pantheon brickwork, placed it carefully in a plastic bag which he kept in his fur and called out loud, "There are no hoppy endings for the "Agents of Rabit!"